Learning is acquiring new, or modifying and reinforcing, existing knowledge, behaviors, skills, values, or preferences and may involve synthesizing different types of information. The ability to learn is possessed by humans, animals and some machines. Progress over time tends to follow learning curves. 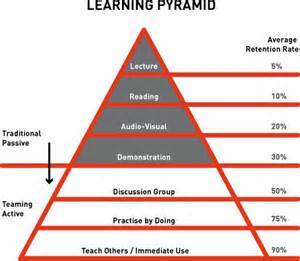 Learning is not compulsory; it is contextual. It does not happen all at once, but builds upon and is shaped by what we already know. To that end, learning may be viewed as a process, rather than a collection of factual and procedural knowledge. Learning produces changes in the organism and the changes produced are relatively permanent. Human learning may occur as part of education, personal development, schooling, or training. It may be goal-oriented and may be aided by motivation. The study of how learning occurs is part of neuropsychology, educational psychology, learning theory, and pedagogy. Learning may occur as a result of habituation or classical conditioning, seen in many animal species, or as a result of more complex activities such as play, seen only in relatively intelligent animals. Learning may occur consciously or without conscious awareness. Learning that an averse event can’t be avoided nor escaped is called learned helplessness. There is evidence for human behavioral learning prenatally, in which habituation has been observed as early as 32 weeks into gestation, indicating that the central nervous system is sufficiently developed and primed for learning and memory to occur very early on in development. Play has been approached by several theorists as the first form of learning. Children experiment with the world, learn the rules, and learn to interact through play. Lev Vygotsky agrees that play is pivotal for children’s development, since they make meaning of their environment through play. 85 percent of brain development occurs during the first five years of a child’s life. The context of conversation based on moral reasoning offers some proper observations on the responsibilities of parents. The Wikipedia article begins by making the point that “learning is acquiring new, or modifying and reinforcing, existing knowledge, behaviors, skills, values, or preferences and may involve synthesizing different types of information.” Real learning is an amazingly complex process of acquiring, modifying and reinforcing previously acquired knowledge and experience. It is a complex and creative process rather than merely a collection of factual and procedural knowledge. Learning involves “making connections” between various phenomena. “Learning how to learn” is as important as any factual knowledge, interpretative ideas and particular skills we acquire along the way. It has been said that “learning is change,” and that one of the difficulties with learning is that it challenges us to change. Change is essential to growth. When we become to comfortable and settled with what we already know and believe, than learning something new becomes a threat to our established psychological equilibrium. “Don’t confuse me with the facts” is a way of saying that I’m comfortable with my current assumptions, beliefs, values and commitments, and that learning something new may rock the boat. Why do some people become passionate life-long learners, while others seem to stop learning, being curious, asking questions, acquiring knowledge and making connections along the way? What habits and disciplines help you to be a passionate life-longer learner? What questions intrigues you? What knowledge fascinates you?